Summary: A new study reports supamammillary glutamate neurons in the caudal hypothalamus play a critical role in wakefulness. Neurologists had suspected that a component of the “ascending arousal system” could be found in this part of the brain for more than 100 years, but the precise location had been a mystery. In mice, activating this region using targeted chemical genetic techniques resulted in prolonged wakefulness during the animals’ normal sleep periods. “Given these connections, this region may be important for the voluntary maintenance of wake and attention, but more work is needed to study this,” he says. For decades, neurologists had known that damage to the hypothalamus – including that seen in the mysterious post-World War I epidemic encephalitis lethargica – resulted in marked sleepiness. 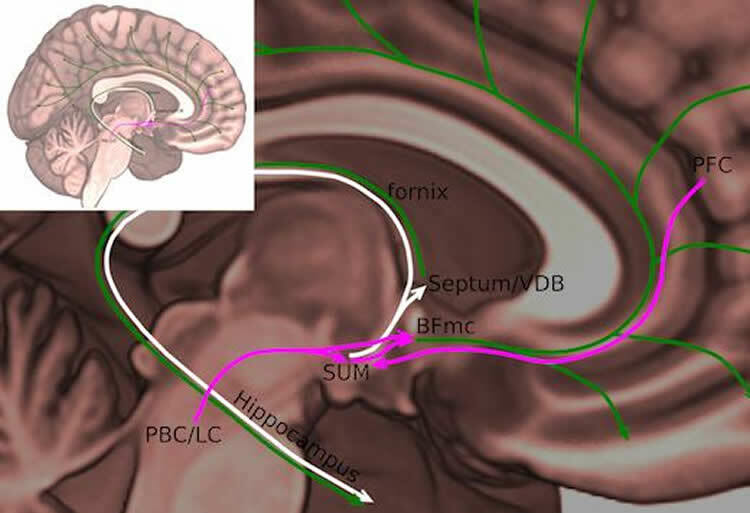 Now that the location and identity of the wake-promoting neurons are precisely defined, the supramammillary region joins other parts of the brain known as being involved in keeping people awake, such as the nearby lateral hypothalamus, the upper brain stem and basal forebrain. Investigators mapped precisely where their injections went and which ones promoted wakefulness; only those involving the supramammillary nucleus did. So what does having this part of the brain stimulated “feel like” for the mice? Supramammillary nucleus in human brain. NeuroscienceNews.com image is credited to Nigel Pedersen. Funding: The research was supported by the National Institute of Neurological Disorders and Stroke (R25NS070682, R21NS082854, R01NS073613, R01NS092652, R01NS085477), the National Heart Lung and Blood Institute (P01HL095491) and an American Academy of Neurology and American Brain Foundation Clinician-Researcher Training Fellowship. Image Source: NeuroscienceNews.com image is credited to Nigel Pedersen. Emory Health Sciences “New Wake Promoting Node Pinpointed in Brain.” NeuroscienceNews. NeuroscienceNews, 10 November 2017. Emory Health Sciences “New Wake Promoting Node Pinpointed in Brain.” http://neurosciencenews.com/wake-promoting-node-7907/ (accessed November 10, 2017). Basic and clinical observations suggest that the caudal hypothalamus comprises a key node of the ascending arousal system, but the cell types underlying this are not fully understood. Here we report that glutamate-releasing neurons of the supramammillary region (SuMvglut2) produce sustained behavioral and EEG arousal when chemogenetically activated. This effect is nearly abolished following selective genetic disruption of glutamate release from SuMvglut2 neurons. Inhibition of SuMvglut2 neurons decreases and fragments wake, also suppressing theta and gamma frequency EEG activity. SuMvglut2 neurons include a subpopulation containing both glutamate and GABA (SuMvgat/vglut2) and another also expressing nitric oxide synthase (SuMNos1/Vglut2). Activation of SuMvgat/vglut2 neurons produces minimal wake and optogenetic stimulation of SuMvgat/vglut2 terminals elicits monosynaptic release of both glutamate and GABA onto dentate granule cells. Activation of SuMNos1/Vglut2 neurons potently drives wakefulness, whereas inhibition reduces REM sleep theta activity. These results identify SuMvglut2 neurons as a key node of the wake−sleep regulatory system.